Green tea has long been considered a beverage with many health benefits. Matcha green tea however is a super strength version that is around 10 times more nutritionally dense than regular green tea. 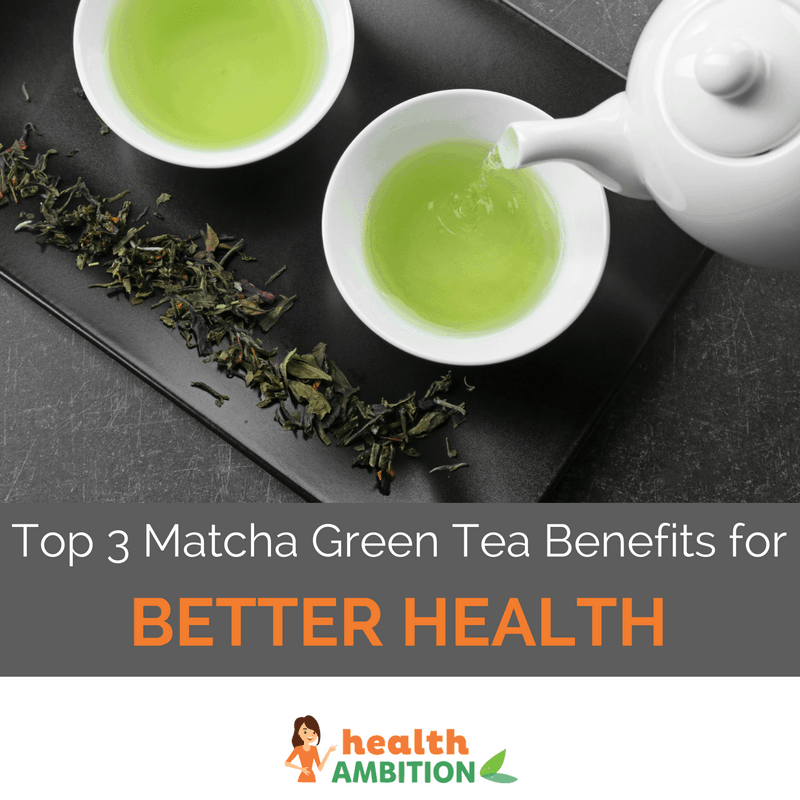 Delicious to drink, both energizing and relaxing at the same time and extremely high in antioxidants, here’s 3 great reasons to switch to Matcha green tea for better health. Antioxidants protect your body from free radical damage that can lead to many serious diseases like cancer and heart disease. They also have an important role to play in detoxifying your body, maintaining your immune system and protecting your eyes and skin from free radical aging. Green tea is recognized as a great source of antioxidants but powdered Matcha green tea is much more powerful. In fact, matcha green tea benefits include having one of the highest antioxidant ORAC ratings of any food or drink ever measured. A foods ORAC or Oxygen Radical Absorbance Capacity score measures its antioxidant concentration and ability to extinguish free radicals. Matcha has an ORAC rating of 1384 TE/g which is even higher than the much hyped Acai berries at 1027 TE/g. Amongst its many beneficial antioxidants, one of the most important in Matcha green tea is Epigallocatechin gallate, more commonly called EGCG. High quality matcha like this has been measured as having an incredible 137 times more EGCG than regular green tea. Studies have shown EGCG benefits the cardiovascular system and one of the most valuable Matcha green tea benefits may be reducing a person’s risk of atherosclerosis, especially coronary artery disease. Matcha has also been demonstrated to both reduce the levels of unhealthy LDL cholesterol while simultaneously raising helpful HDL cholesterol. Powdered matcha also contains many other important catechins such as epicatechin, epigallocatechin and epicatechin gallate as well as flavonoids like kaempferol, quercetin and myricetin. All of these antioxidants work in synergy within your body to help provide the many health benefits of Matcha green tea. Like all teas from the Camellia Sinensis plant, Matcha contains some caffeine. A half teaspoon serve usually has around 35 mg of caffeine, which is well under half the caffeine of an average coffee at 80 – 120 mg. There are two unusual reasons though why the caffeine in Matcha green tea provides a much more balanced and even relaxing energy than the jittery rush of a cup of coffee. The first is the high levels of catechins found in the powdered leaves of the young green tea plant. These extremely healthy antioxidants tend to bind with the caffeine molecule in Matcha powder and slow down its release into your bloodstream. This leads to a much gentler and more sustained release of caffeine that is less likely to raise cortisol levels too high and lead to body tension or anxiety. The second is a unique amino acid called L-Theanine. Found primarily in the tea plant, L-Theanine levels are massively increased in Matcha green tea versus regular tea by keeping the young green tea leaves in shade before harvesting them. This also gives Matcha its naturally sweet and almost creamy green tea flavor. The health benefits of L-Theanine are so significant it has become a popular supplement in its own right, but far and away the best way to get L-Theanine into your diet is by drinking a cup of natural Matcha green tea. L-Theanine has been observed in scientific studies to stimulate alpha brain wave production. Maintaining alpha brain waves leads to a relaxed state of mental clarity and calm alertness more often associated with meditation practice. L-Theanine also directly counteracts any overstimulation of cortisol or adrenaline by caffeine. This can lead to a long lasting and sustained energy and ability to concentrate, without the rush and crash of strong coffee or so called energy drinks. More research has found L-Theanine can help to lower high blood pressure, enhance memory and cognitive abilities, have a protective effect on the brain and even help improve the quality of your sleep. The traditional method of harvesting the tea leaves for Matcha production sees them shaded for several weeks prior to harvesting. This increases the health benefits of Matcha green tea compared to regular green tea significantly, particularly in L-Theanine levels but also in chlorophyll concentrations. Chlorophyll is an amazing nutrient with many health benefits. It is highly alkaline and known to help balance pH levels in your blood. A powerful detoxifier with anti-bacterial and even antioxidant properties, chlorophyll is the main reason why wheatgrass is considered so healthy. Matcha green tea is much nicer to drink though and a good source of blood cleansing chlorophyll. I wouldn’t worry too much about having expensive wheatgrass shots at juice bars when you’re drinking Matcha green tea regularly. Drinking Matcha, with its calming L-Theanine and caffeine regulating catechins provides a much more balanced and stable energy than energy drinks, coffee or even regular black tea.People who drink Matcha green tea regularly report an increase in mental alertness, an enhanced ability to concentrate and a greater sense of well-being. This is likely to be due to the uniquely high levels of the amino acid L-Theanine. Matcha contains exceptional levels of antioxidants such as epigallocatechin gallate and other catechins and flavonoids. Its ORAC rating of 1384 ranks it considerably higher than even Acai berries. The rich concentrations of chlorophyll found in a good Matcha green tea work to alkalize and detoxify the blood. Acidic blood overloaded with toxins puts the body at risk of disease. By cleansing the blood and increasing its pH the body has a better chance to get more oxygen and nutrients to cells for healing. If you’d like to try Matcha green tea for yourself there’s a few important things to look for. Firstly, if you’re buying a product for its health benefits like Matcha it makes no sense to be ingesting residual herbicides, pesticides or other potentially damaging chemicals. A healthy Matcha green tea should be certified organic and ideally come from Japan where the organic certification is of a stricter standard than in the USA or China. Japanese Matcha is considered the best anyway and it’s not just about the superior taste. The traditional methods used in Japanese Matcha green tea production and harvesting have been shown to increase the antioxidant levels and significantly raise the amount of L-Theanine and chlorophyll in the tea. After a lot of research I chose this Japanese grown and produced organic Matcha green tea. It tastes much richer and almost creamy compared to regular green tea. It’s also guaranteed to be completely pure and additive free and contain no detectable levels of pesticides, fungicides or herbicides. Like most good Matcha it comes in various levels of quality. If you’d like to try the highest quality Matcha green tea then try the ceremonial grade. I tend to keep that for special occasions but it is very good. To make Matcha tea properly like the Japanese do you use a small whisk and froth it up first. Here’s a video of exactly how traditional Matcha is made. I’ve tried it this way and it is better but I must admit most of the time I simply put half a teaspoon in a mug, pour hot but not boiling water over it and stir it briskly. For daily drinking if you don’t have a lot of time this is almost as good. It’s recommended to turn your kettle off a little before it boils and let it sit for a minute so the sediment settles before pouring it into the cup to make Matcha. Try pouring freshly boiled water straight into a glass and looking at all the particles floating in it if you need any convincing on the value of this. Matcha green tea has a natural delicate sweetness and it’s best enjoyed without sweetener, especially not fattening white sugar or artificial sweeteners. If you would like a little extra sweetness try a single drop of stevia, which should provide more than enough. I hope you enjoy the many health benefits of Matcha green tea if you decide to start drinking it for yourself. I’ve personally found it provides a much more calm and stable energy than coffee and would highly recommend it as a very healthy beverage to drink in the morning. What Are the Best Green Tea Extracts & Supplements in 2019? Is the brand name STASH that makes the matcha green tea a good quality product for matcha tea? I was lucky to be introduced to matcha by a good friend because I now see that it has many elements that can help improve a person’s health. After watching this video I feel the need to share this because I spent years jumping from diet to diet without seeing any success until I came across Diana’s magic plan (just google it). It is without a doubt the best weight loss that I have ever achieved and I am still trim to this day.